It was a wild day of weather on the Outer Cape. A string of storms Thursday brought high winds, lightning strikes and inches of rain. Parking lots were flooded, and Route 6 was even closed down at one point. A wild day of weather on Cape Cod Thursday included lightning strikes and high winds. Heavy rain led to severe flooding, even closing down Route 6 at one point. Alexander Barroso says the largest of several lightning strikes during the morning's storm set flames to his roof. It can be seen smoldering in video. Heavy rain followed the lightning and put cars in precarious situations as they navigated flooded roads in Orleans, where photos show high water levels. One photo shows the tires of a vehicle nearly submerged in the parking lot of Friends' Marketplace on Main Street. 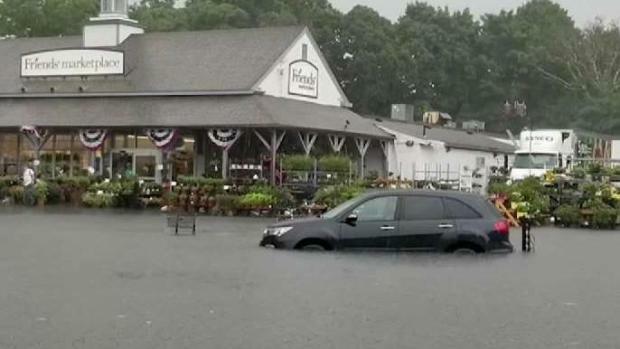 Cape Cod experienced flooding Thursday. "The sky opened up," Rebekah Eldridge said. "I've never seen it like that." Eldridge, who works at Skaket Beach, took video of the rain smacking against the concrete with winds whipping around barrels and knocking over lifeguard stands, leaving a lifeguard's windshield shattered. "The wind just started to blow and it was like a hurricane," she said. "The trees were sideways, I've never seen it. And there were strikes everywhere, all over the beach." For houses along the beach, renters like Amanda Fenwick stayed inside and got quite the scare. "When we saw the patio furniture go, I just quickly said to my kids, 'it's time to go in the back,' and they went in the back and were a little nervous and shooken up," she said. Some residents say they have several inches of rain water that still has to be pumped out. Click here to see the latest severe weather advisories, watches and warnings.